Shivraj Chouhan said while his government is taking care of all sections of the society, Congress just dreams about seeing him out of power. Shivraj Singh Chouhan is popularly known as 'mama' in Madhya Pradesh. 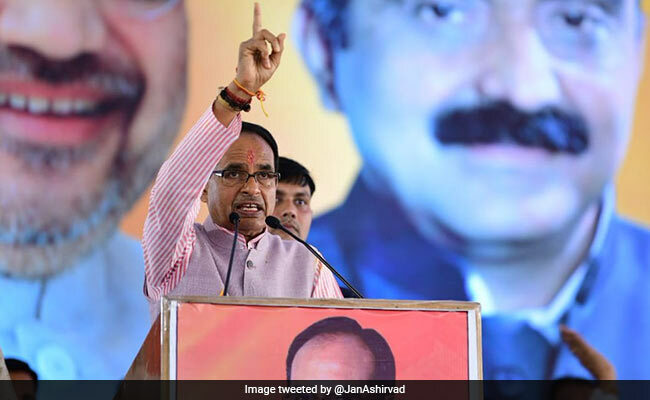 Madhya Pradesh Chief Minister Shivraj Singh Chouhan Friday said he believes in development of the people of the state, while the Congress is only interested in defaming his government. Mr Chouhan said while his government is taking care of all sections of the society, the main opposition party just dreams about seeing him out of power. "I have opened new vistas of development, including for the welfare of bhanje-bhanji (nephew and niece), built the Kundalia dam in Rajgarh district and launched Teerth Darshan Yojna (a state sponsored scheme for the elderly). "The Congress, on the other hand, just expresses anger at these things," he said. Mr Chouhan, who is the the chief minister since 2005, is popularly known as 'mama' in Madhya Pradesh. Mr Chouhan was addressing a rally after accompanying BJP candidates who filed their nomination papers from various assembly seats in Rajgarh district for the November 28 polls. "The Congress has nothing to claim in the name of development. It is just running false advertisements on television to defame my government," he alleged. The BJP chief minister said in the days to come every inch of land in the district will be covered by irrigation facilities. "I am sending our old-age parents on pilgrimage tours, sons and daughters to good educational institutions, making daughters `Ladli' (a scheme where money is deposited in bank a/c of girls soon after their birth) as I understand the pain of women, but the Congress leaders just get angry," he said. Mr Chouhan said the Congress is only interested in disapproving the work being done by the BJP government. "Even when I took a resolve to remove poverty from the state, the Congress got angry, when I waived power bills, the Congress got angry. They only see mama in dreams and always think when this mama will go," Mr Chouhan said.